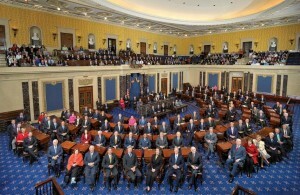 The senators in their seats as shown on the Senate website. 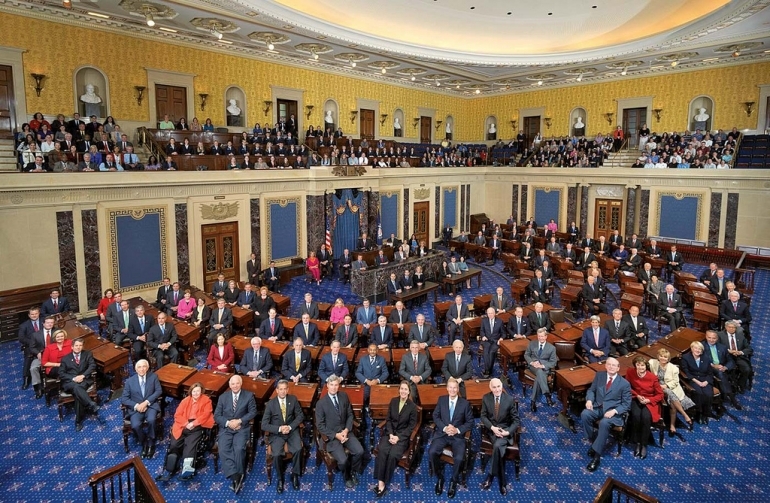 The Democrats in the U.S. Senate last week changed a rule that has governed the Senate since the earliest days of the republic, and the country may come to regret it. No longer will a three-fifths majority be required to confirm people for important government jobs. A simple majority now will suffice. The Democrats changed the rules because the Republicans refused to confirm judges nominated by President Obama, and they regarded this as preventing the government from working as it should. Well, the House has just voted for a bill intended to keep the government from imposing needless regulations on fracking, the method by which industry has sharply improved our fuel and energy supply. The bill, though, will die in the Senate, where the Democrats are in charge. So, if the Democrats block action on something, it’s called democracy. If the Republicans block action, it’s called obstruction. That kind of double standard may be routine in politics. But it also causes citizens to become cynical about our form of government. So what “checks and balances” keeps the republicans from blocking every single little thing the senate does? Evolve Hasso….. EVOLVE. Accept the future. Stop being a pissy old man. It isn’t 60 years ago anymore.